Keep that coffe, hot chocolate, or tea warm by cozy-ing up your coffee cup! Not all coffee cups are created equal. If you want a good fit, I would highly suggest taking a few seconds before you get started to take a couple of measurements. 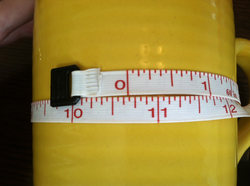 First, you will need to measure the circumference of the cup. All the way around the outside of the cup. My cup measured approximately 10 3/4 inches. Next, measure how tall your cup is. fuzzy yarn on my lips, nor do I want to leave any lipstick on my beautiful cozy. At this point, it’s a good idea to stop & take another quick measurement. 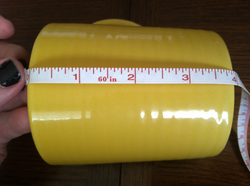 Since mugs come in different sizes, you want the length of your cozy to be about ¾ of an inch to 1 inch shorter than the circumference of your cup. 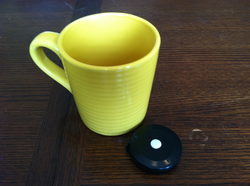 We will be making a tag of sorts to make up the different and reach through the thumb hole of our mug. Rows 39-41: Repeat row 38. Row 43: Ch 1, turn; Hdc in first st, Hdc 3 times in ch 2 sp, Hdc in next sts. Turn your work to the side and begin placing a single crochet in each stitch around the entire perimeter of the piece; placing two sc in each corner. Once you have worked your way around to your first sc, sl st in that first sc. Fasten off& weave in ends. 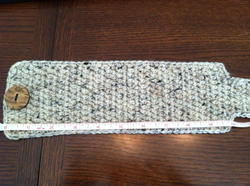 Next, you will need to attach your button to the wide end of your cozy using the needle & thread. 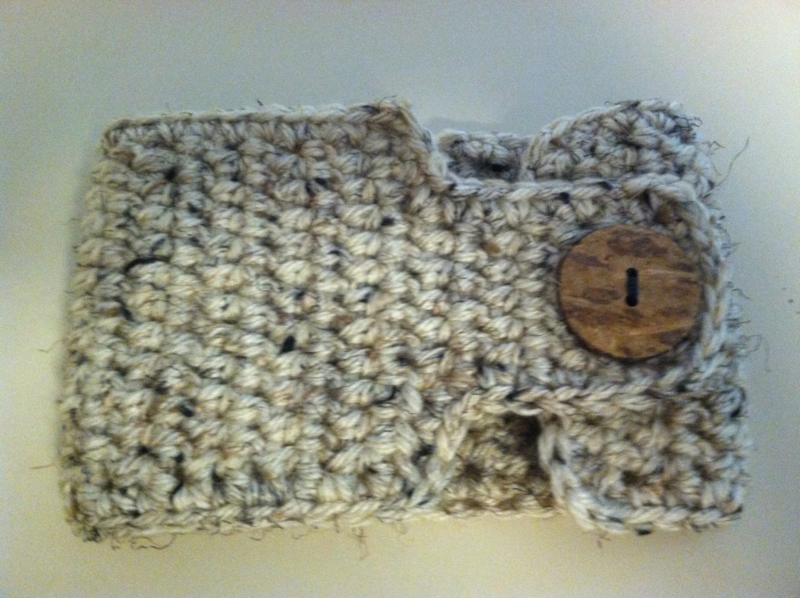 Finally, wrap your cute cozy around your coffee cup& fill ‘er up! Enjoy!